Fertilizer manufacturers commonly employ the Haber-Bosch (HB) technique to produce ammonia (NH3) to be used as a fertiziler for agriculture - a process that consumes 1-2% of global energy. The HB process involves first separating nitrogen (N2) from air, then breaking the very stable nitrogen-nitrogen bond, and finally combining these atoms with hydrogen to form NH3. Moreover, ammonia production requires huge capital investments for reactors operating at high pressure and temperature, base-load power to keep the process running continuously, and distribution infrastructure to ship the resulting chemicals around the world to agricultural fields. Ammonia can also be used as a fuel in fuel cells or internal combustion engines for both stationary and transportation applications. Small-scale reactors could enable distributed ammonia production closer to the consumer and be more compatible with energy inputs from intermittent renewable energy resources - improvements that could dramatically reduce the energy and carbon intensity of ammonia production and distribution. 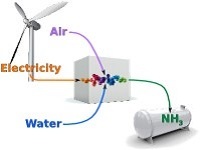 If successful, the proposed technology could enable distributed ammonia production for alternative fuels and agricultural use, decrease energy input by more than 20%, and substantially simplify the process. Around half of U.S. ammonia is currently imported. The proposed method enables domestic and distributed ammonia production to limit supply vulnerabilities. The team's innovations could enable small-sale ammonia reactors that operate using intermittent renewable energy sources, thus making a zero-carbon fuel and fertilizer thereby reducing our carbon footprint. Low-cost production of ammonia could benefit stationary and transportation energy sectors as a lower cost alternative to batteries for long-term energy storage.